To see a preview of what is in the box and a short history, visit the preview. Construction starts on this one with gluing the two fuselage halves together. No cockpit, no canopy, no muss, no fuss. Naturally, I needed a touch of filler on a few spots, mostly because I'd gouged the plastic removing the parts from the sprue. Meanwhile, I went to work on the handling trolley. The major parts of this need to have the mold seams removed as well as the rather substantial number of ejector pin marks on the upper framework. In addition, the larger pieces of the upper framework have some pretty big sink marks that need to be filled. Now there is no reason to make this super smooth as it was pretty roughly assembled, but the sink marks would be a bit much. After the usual sanding and filler, the entire assembly was painted RLM 66 dark grey. The wheels were also painted this color and the 'tires' were painted black as recommended by the kit instructions. A bit of clean up of missed areas and touchup painting and the cart was done. Simple. Turning to the missile itself. the first thing was to glue the fuselage halves together. Another simple step. There was the usual (for me) bits of filler needed at a few places, but nothing major at all. The pulse-jet intake was painted black and then dry-brushed with aluminum. This was glued on and the forward cowling attached. This is the worst fitting part of the entire kit. Nothing really bad, but it did need some filler to smooth out the seam area. You really need to be careful when building this as the pitot tube is constantly in the way. Mine was pretty bent by the time the kit was done, but did manage to stay unbroken. A bit of a minor miracle. With that done, the horizontal stabilizers were glued in place and when dry, it was off to get some paint. 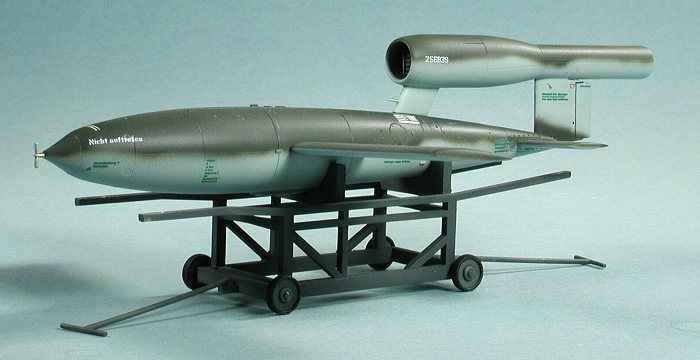 V-1s can be painted in a wide variety of schemes and though most of them tend to green over light blue, you have a variation in colors for that. The most common colors were RLM 71 over RLM 65 or 76 in a pretty straightforward scheme. This is the scheme used for the initial production versions that were fired off in the Summer of 1944. Some of them eventually had mottling and squiggle patterns as well as being built from preassembled components which made for some unusual paint jobs. Some were even in a buff or yellowish color and some were in a number of primer colors. However, I decided to be pretty straight-forward and do this one in RLM 71 over RLM 76. There is no real need to be very particular about how tight your painting is on these. 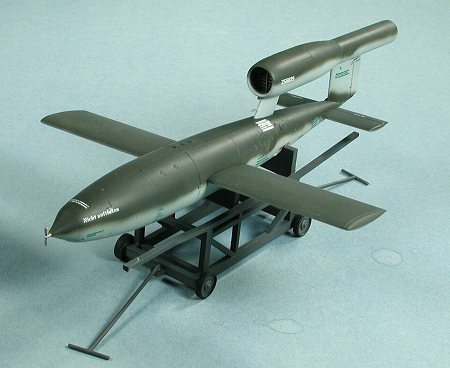 After all, the V-1 was an expendable missile and only intended for a single flight. No need to waste camouflage artistry on them! 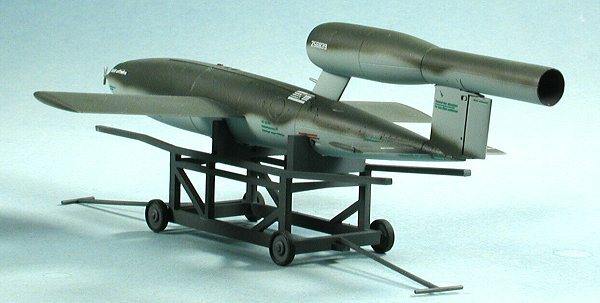 Once the paint had cured, the missile was given a clear gloss coat and the decals applied. There are serial numbers for two versions, both of them identical. The decals worked very well, but were not really to the standard of the rest of the kit. While the larger letter/number ones were OK, the smaller ones were nearly illegible and a bit fuzzy. I know that decals can be made crisper than that as I've used them before. There also seem to be a lot of stencils for such a small vehicle, but the end result is pleasing enough. Don't even think about looking for an aftermarket sheet!! Once the decals were applied, the single piece wings were slid into place and glued. No need to sweat any wing fuselage filler as the real V-1 wasn't that tightly constructed. After the decals were applied the kit was given a matte clear coat, a bit of touch up painting and it was done. I had started it as a weekend project, but for me such a thing does not exist aside from a snap-tite! It took about 10 days, most of that time between coats of paint or filler. After publishing the preview and stating how nice and accurate the kit was, I got several e-mails, some of them rather vituperative about how 'screwed up' the kit was. Well, it looked good to me, but in all fairness, I figured I'd better check it out, something I rarely do to a kit. There are a number of references on the V-1, the best one being 'V Weapons of the Third Reich'. This is one of the Monogram Publications tomes that have come to be highly respected references when it comes to thoroughness of research. 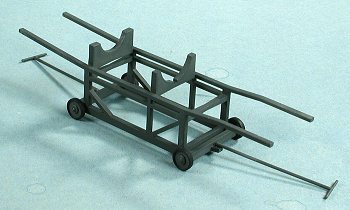 I took the fuselage of the kit and placed it upon a three-view of the V-1 in the book. Lo and behold there are some rather obvious differences. If you'll take a look at the image to the right, you'll see that there are several areas of concern. 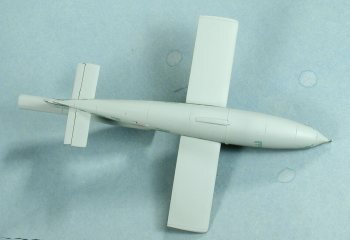 The Tamiya kit's fuselage center section is tapered when it appears it should be cylindrical. This makes the forward pylon too long. The engine itself is too cylindrical at the front and too small in diameter, further exacerbating the problem. It also appears that the fin and rudder are too tall. Fixing these would be way too much trouble for just about anyone. These areas of difference can be discerned from photographs as well. Now in all truth, most modelers, myself included, would not see the difference if they were not pointed out. However if you are looking for the most accurate V-1, look elsewhere as this kit isn't it. Just as an additional bit of information, there are several varieties of V-1, depending on the warhead or the size of it. Some had very different shaped noses which is a clue to the warhead type. The kit portrays the most common type and is designated as type A-1. Therefore, the correct designation of this particular variant is the V-1A-1. Well, I must say that learning that the model wasn't super accurate did not detract from the fun of building it. You get a really neat looking display item for not that much money. Most people won't care about the shape differences and really, unless you are totally absorbed by the subject, neither will you. It is a simple kit to build and one that will look neat on your shelf. 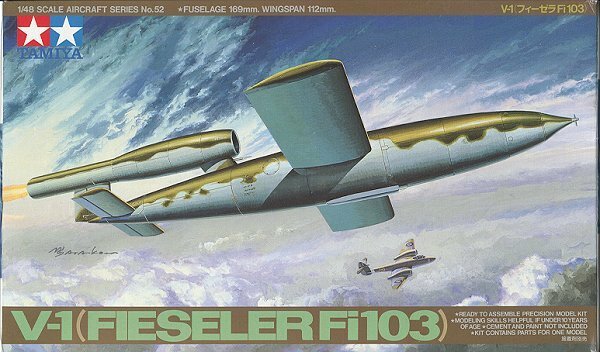 It is a kit I can recommend to all levels of modeler. V Weapons of the Third Reich, Monogram Publications, 1994. If you would like your product reviewed fairly and fairly quickly by a site that has thousands of visits a day, pleasecontact the editor or see other details in the Note to Contributors.